The two times British Masters marathon winner crossed the line on the South Shields seafront in 67th position with a time of 1:14.44. 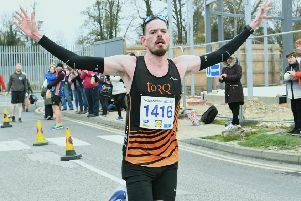 Stamford Strider Simon Fell finished 146th in 1:19.05 coming home just behind the Peterborough AC pair of Amittai Ben-israel and Shaun Walton, who were 124th and 134th respectively. Their coach, 53 year-old Paul Larkins, broke the 90-minute barrier with a finishing time of 1:28.02. Kyle Warner of Nene Valley finished 65th out of 640 in the junior race, while Simon Fell’s son Isaac, who is fighting cancer, was given the honour of starting the junior race.